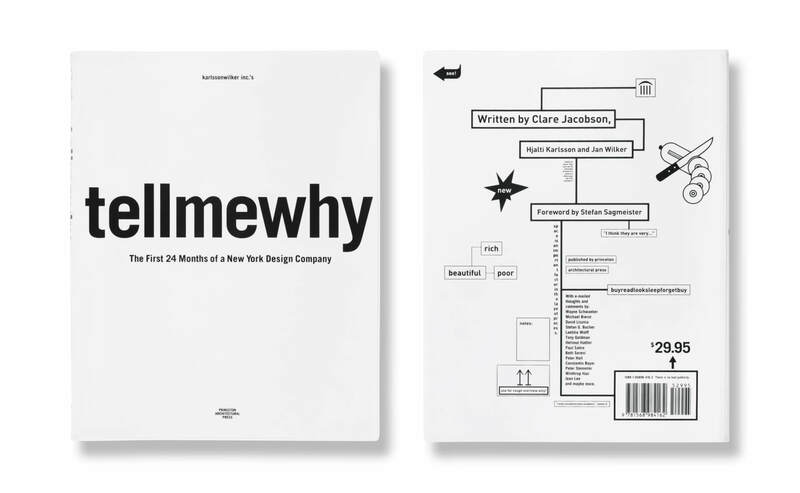 tellmewhy—the first 24 months of a New York design studio is the story of our beginnings: two young, wide-eyed designers, one from Iceland and one from Germany, who started up their own studio without any clients, in the midst of a recession, in a city brimming with world-renowned designers. It was published some time ago, in 2003, by Princeton Architectural Press. We conceived it as an anti-monograph, a counterpoint to the high-gloss, celebratory publications that designers back then published to present themselves in the best possible light. This book did not try to do that, as it openly shares all the ups and downs, successes and failures of our back then brand-new endeavor, candidly and with humor. You can read about the ordinary office life and some less-than-romantic tales about rooftop parties, battles with immigration, language obstacles, missed meetings, and of course, money problems. Every single project that was designed in these first two years are included in the book, as well as their back-stories. The main story was written by the great Clare Jacobson, after sitting with the two of us for many weekends. The book itself, we designed in two weeks. It was meant as an informative and entertaining moment in time, the birth of a studio, before it falters or leaves its mark, before bad memories fade and leave behind a clean, perfect past. It sold out quickly and became a fairly well-known design book around the world, helping our studio on its way to stay afloat and push forward. Still available on the secondary market today, you can find your copy at Amazon or your local used bookstore.